Should you be interested in buying the best electric wheelchair, you have to choose between spending your free time reading countless electric wheelchair reviews or checking out our comprehensive buying guide. We’ve done research for you and our findings show that the first product to consider is the Foldawheel PW-1000XL, due to its various functions. First of all, it works on two batteries that only weigh 3.5 lb each. Paired with the weight of the item (53 lb), it makes for a convenient and easily portable design. It measures 19 inches between armrests and can withstand a mass of approximately 330 lbs, which makes it compatible with many patients. The maximum speed it can reach is 5 miles/hour, and by using the two batteries wholly charged, you can get as much as 18.5 miles of traveling. If this model is unavailable, we suggest you check out the Drive Medical Scout Compact, as it would make for an excellent second choice. This wheelchair can be utilized by seniors and disabled persons with weights of up to 300 pounds. After charging the battery, you can use the unit to travel for up to 18.5 miles, so that should give you plenty of freedom to benefit from. Another note we must make in relation to it is that it comes with four spring suspensions, so you won’t feel going over a bump as harshly. The cost can be slightly off-putting if your budget doesn’t allow you to choose such a device. This product can be adjusted as per your personal needs and you can control it using the joystick included. The Scout Compact is easy to use and does precisely what it has been designed to do. It boasts non-marking wheels and can be used both indoors and outdoors. Also, you’ll find that this model comes with a steering handle, so controlling its moves and the direction is very easy. The seat of this model comes with a backrest as well as two comfortable armrests. You have to keep the battery charged because there’s no way you can use the unit otherwise. Use this convenient electric wheelchair both indoors and outdoors since it comes with non-marking wheels. This Drive Medical option is just as effective as others we’ve come across, but it does have a unique and handy feature. It’s equipped with a basket in the front, so you can use it to store your essentials from tissues and water to emergency medication and the likes. This unit is easy to work with and can be maneuvered swiftly and comfortably. Its suspension isn’t quite as effective as that of others, so use it on flat and unobstructed terrains. Since it is more than capable of doing what it is supposed to, this model works for most seniors out there. Looking for good electric wheelchairs in this overcrowded market can indeed be a challenge, but we’re here to make your task easier by presenting a few alternatives that we consider to be top picks. This electric chair is designed to hold a patient that weighs up to 330 lbs. Not to say that it couldn’t withstand any more weight, but from that point onward it wouldn’t be comfortable for the user. It measures 19 inches from one armrest to the other and features a seat cushion in between. The model works using two battery units that, when fully charged, can allow you to travel for up to 18.5 miles without having to recharge. This device can hold up to three units that can provide an extra ten miles but depending on your requirements, two should be more than enough. Its rubberized tires measure ten inches and have a texture that provides comfort. The four spring suspensions and the quiet motors make this wheelchair a good alternative when it comes to not disturbing noise and the patient’s coziness. It also features a joystick controller to allow you to adjust movement. A design that’s easy to assemble even by the less experienced ones, the Scout scooter allows the user to maintain the same level of comfort regardless of how uneven the terrain that he or she is traveling through might be. By featuring non-marking wheels, this model can be used both in outdoor and in indoor spaces. The steering handle is shaped to make driving accessible and effortless, even if your movements are hindered due to age and health issues. The overall height is of 19 inches. Its seat contains a backrest and armrests to increase the patient’s comfort. All these items are padded and covered in a layer of durable material, making them resistant to attrition. Another aspect worth mentioning is the fact that this item runs on two 12V x 12AH batteries. It’s also equipped with non-marking wheels. The exterior design is customizable, the packaging containing two colors of interchangeable color panels, red and blue. This three-wheeled model features interchangeable color panels just like its four-wheeled counterpart, allowing the user to adjust the exterior design according to their preferences. The assembly process is fast and doesn’t require any mechanical skills. All the elements of the seat, including the back and armrests, are padded and adjustable to your preference. This way, the comfort of the user is taken care of, and the components can match the weight and body size of the patient. It works on two battery units that can be easily connected. A large basket that can be placed in the front of the vehicle and used for storing different items you might need is also included in the packaging. The throttle control is designed to be ergonomic and easy to maneuver, requiring a minimal amount of driving skills. The accepted climbing angle that this vehicle offers is 6 degrees. The anti-tip wheels and ergonomic throttle design are just a few things the DST has in common with the other Drive Medical wheelchair scooters for sale. What this item brings to the table is a four-wheeled vehicle that features Dynamic Suspension technology. This is what allows one of the most comfortable rides you’ll have on this sort of device, due to the front and rear suspension coils. No matter the type of terrain that you might be on, the level of comfort will not be modified one bit. Aside from this new technology, its characteristics are roughly the same, including a headlight for safety purposes, interchangeable color panels to allow you to customize the design as you wish and padded armrests, seat and backrest that can be adjusted to the size of the patient. The seat’s height can be adjusted as well, and the backrest can be folded down if you want to store the wheelchair away. The maximum weight capacity this item has to offer is of 300 lbs. It has an adjustable seat that can slide and swivel according to your needs and can increase the comfort of the user because it perfectly fits his or her body’s measurements. Other aspects that make this a reasonable alternative are the deluxe captain seat and full tiller shroud, both working to increase the level of coziness and support that the patient gets. Aside from being made up of padded components, the seat can also be adjusted in height, until you reach the optimal position. This vehicle can just as quickly be used indoors as it can be used outdoors, due to the texture of the tires. It has ten speed levels that you can choose from and a headlight set to help you travel safely even in low light situations. A three-wheel alternative that comes with a removable battery pack and a storage basket placed in the front, the Scootie received this name due to its reduced dimensions and compact design. Despite this, it has a weight capacity of 250 lb and can fit more than just one body type because all of its components are adjustable, from the flip-up armrests to the height of the padded seat. The backrest is padded as well and provides a comfortable traveling environment. Maneuvering this device is a lot more comfortable than is the case with other four-wheeled models, but it provides the same type of stability due to the articulating front wheel. Aside from being small in itself, this product also folds down for easy transport. The lightweight model can be driven outdoors under the condition that the road is paved and not too bumpy. You can use it no matter the weather conditions, but it is advisable that you avoid going outside when it’s raining. This blue design has a 250 lb capacity, and it roughly weighs 70 pounds, being one of the options that are easier to transport due to their compact design. Like most scooters, it features a storage basket attached to the front, above the wheel, where you can keep your shopping bag, purse or any personal belongings. The battery pack can be removed easily to charge them and connected immediately afterward, requiring no mechanical skills at all. The height of the seat can be adjusted, allowing you not only to find the perfect position for comfortable traveling but also to occupy less space when you’re storing the item. What’s more, aside from being lightweight, this product also can be disassembled into three components, each weighing less than 35 lb. It would make an interesting choice if you find yourself continually traveling and you need this sort of vehicle at all times. In finding a wheelchair and scooter, you need to pay close attention to every detail, given that this is a worthwhile investment that you’re going to be using for many years to come. Make sure the technology it uses, the materials, and the design are all up to date and adequate for your requirements. To make sure you don’t pick something less suitable, we’ve put together some comprehensive advice on how to find the right wheelchair scooter attachment. If you’re keen on this subject and you want to know more about how seniors can improve their lives by using the benefits of modern technology, check out other related articles on our website. For example, you might enjoy the one on reliable laptops for the elderly or an excellent lift chair. In this article, we’re discussing electrical wheelchairs, so it’s safe to say that battery units will power most of the models you’ll encounter in this category. The essential aspect regarding the wheelchair scooter battery is how it can take you.. The manufacturers should provide this piece of information, and you should always check how many miles you can travel using the set of batteries that the device works on when they’re fully charged. If that’s reliable for your daily needs, then you can consider that particular option. Aside from this issue, also consider how difficult is it to disassemble the batteries and attach them back on, whether it requires any skills or qualified help and most importantly how much time it takes for the cells to recharge. Perhaps they’re not rechargeable, and extra units need to be bought every time, that’s an issue as well. The problem with rechargeable models is that if they do not let you know that the power is running out, you’ll need a power outlet to be able to move. This type of item is generally used for local transport, be it in your home or around your neighborhood. But one crucial aspect that you have to think about if you need this device on a daily basis is traveling. If you need to leave your home, be it for receiving medical care in another town or merely for going on vacation, you need to take the vehicle with you, and it might be difficult to transport it if you haven’t paid attention to a few useful features in the beginning. For example, it always helps if the model has a compact design and is lightweight, but given that this can sometimes affect the quality of the materials and the technology used, it’s not always the best option. It would be a lot more helpful if the item can be disassembled into various smaller pieces, each weighing enough to be transported manually or loaded into a car. Make sure assembling all the parts back together does not require any mechanical help. One aspect that shouldn’t be overlooked in any item available for sale is the comfort that the wheelchair can offer. Most products have a padded seat, but sometimes that isn’t enough. Be on the lookout for anything that may also feature padded back and armrests. Also, it’s crucial when it comes to the fit that the components can be adjusted until the optimal position for the patient’s body size and measurements can be reached. The armrests should flip, and the height of the seat should be adjustable as well, not only to make sure you reach the perfect angle for comfortable driving but also to take up less space when traveling. 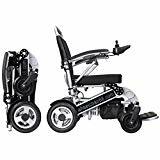 One thing you need to know about searching for cheap electric wheelchairs is you can’t expect to find a high-quality alternative at a bargain price because these aren’t items that go on sale. So you can either settle for a less pricey option that will have lower durability and maybe lack some of the essential characteristics we’ve discussed above, or you can admit to the fact that you’re making a worthwhile investment and you need to consider every aspect carefully. Luckily for you, after following the advice we’ve delivered so far, there shouldn’t be any secrets left with regard to how to choose an electric wheelchair scooter for adults, so we’re confident you’re going to make the right choice. If you’re interested in this topic and you want to know more about senior accessories, than try other similar articles on our website, such as the one on excellent step trackers for seniors or great slippers for elderly women.